Too many casual chainsaw users make the mistake of thinking safety gear isn’t important. I wanted to make a post about the 10 best chainsaw gloves on the market in 2018 specifically to draw attention to this topic. I polled a few of the folks I know, and it sounds to me like people have been choosing gloves based primarily on 1) style, 2) availability. This surprised me. 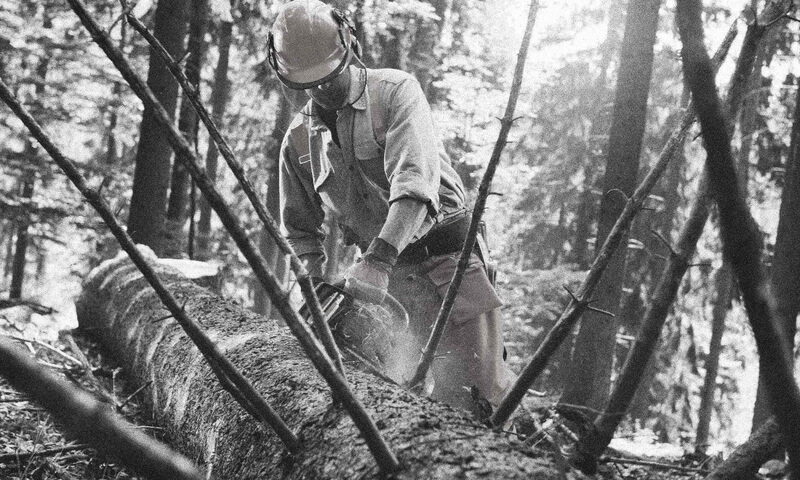 Most of the guys I know who use a chainsaw, either casually or even for a living, tend to be what I would consider to be “macho men”. Not a group that I would think is overly concerned about how a pair of gloves look. But I guess this is a bit like the whole “macho car” thing. Some guys prefer to drive a car or truck that looks a certain way. They want something that looks powerful, tough, etc. Same thing with gloves – they don’t want to be seen wearing gloves that look wimpy, or something that would make them seem like amateurs. And in talking through the availability topic, I’ve realized people who shop in stores tend to buy whatever brand or type of glove the store they are in has available. If they are in Lowe’s or Home Depot, they tend to buy whatever is in stock at that store. People who shop on the internet of course tend to have a wider selection, so availability becomes less of a concern. I think chainsaw gloves need some element of abrasion resistance, as well as some element of cut resistance. Cut resistance probably resonates with everyone. After all, we are talking about using a chainsaw with a chain spinning at thousands of RPM. I mention abrasion resistance, because inherent in doing any kind of work with a chainsaw will be quite a bit of wood handling. That can be really rough on your hands. A good glove will help reduce scrapes, blisters, splinters, etc. It’s great to protect our hands, but if you’re like me you hate that you lose so much of the tactile feel you need to do a job well when you wear gloves. Ideally, a glove makes a good trade-off between maximum protection and dexterity. Grip is critical. 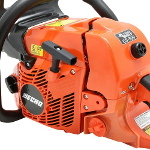 Not only do you have to keep control of the chainsaw, you will also probably be picking up wood and moving logs around. Depending on where you’re working, you may have to use a wheelbarrow or some kind of cart. 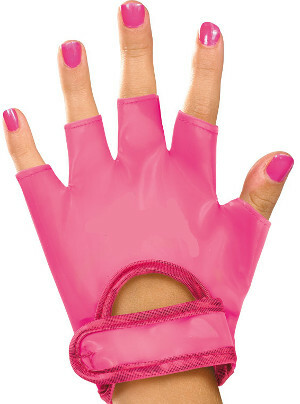 None of that is easy to do if you’re wearing a glove that has slick, low-friction surfaces on its finger pads and palm. This is a fairly broad category. Like shoes, wearing chainsaw gloves that are improperly-sized can actually be a liability. Too large and you risk losing your grip, or getting them caught in a spinning chain. Too small, and your manual dexterity and comfort are impacted. Even if the glove is sized right, some gloves are more comfortable than others. I’m picky about where seams are inside the glove. Nothing wears a blister on me faster than a seam riding right on the tip of a finger. I’ll also mention that I prefer a wrist closure with a strap rather than elastic. It’s not that elastic is terrible. I just feel like I can get the glove more secure with a strap that I can make as tight or loose as I want. These likely aren’t super-cheap, junky gloves that you can throw away after each use. These cost a few bucks, and we are making an investment in our safety. So we would prefer a glove that doesn’t fall apart after only a few uses. One pet peeve of mine is stitching – if a glove is made so cheaply that the stitching starts coming loose, and I see threads flapping around, I don’t like it. Taking a cue from the “performance” section above, we want a glove that can endure some abrasion and some sharp edges. Also, moisture resistance is important, as we can’t be picky when we are in a tough outdoor environment with our saw. I would rank cost as a factor. I guess everyone’s budget is a little different. I tend to be frugal, but maybe less so when it comes to safety gear. I would never say “cost is no object”, but at the same time I’d rather have a glove that performs well than one that I can brag about buying on a blue-light special. The last factor I would consider is style. Some folks would lump the brand of the glove in the same category. As I mentioned before, I understand that many guys don’t want a glove that makes them look like a wimp or a newbie. Since this is my lowest priority, I would consider a good style as just a bonus. It’s a factor in my ranking, it’s just not a particularly important one. Now that I’ve gone over some of the things I considered when ranking gloves, let’s go over some of our options. I’ll actually present these in a table according to rank farther down, so for now they are in no particular order. These are some very high-quality gloves. The seams and stitching are basically perfect. They have a strap at the wrist for closure, which I like. Every inch of the glove is lined with Kevlar, which is almost overkill (in a good way). They have a bunch of non-slip pads on the bottom of the glove to improve grip. They even have a terrycloth insert on the top of the thumbs so workers can wipe away sweat without chafing their face. They are rated as an ANSI cut level 3 and puncture level 4. And you’ll find these are pretty affordable. 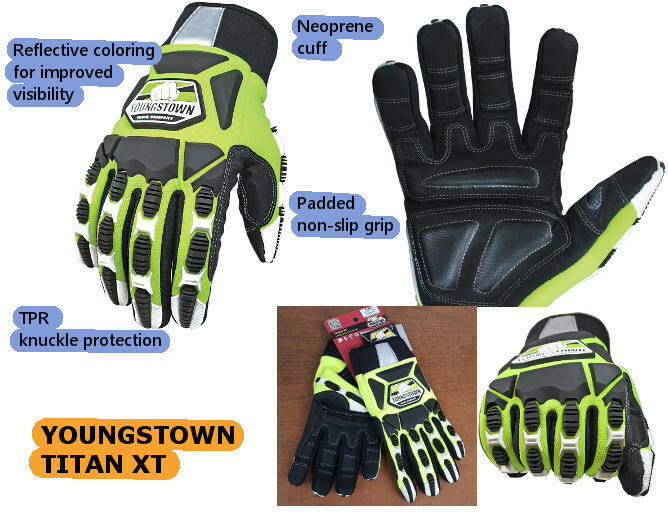 Some folks consider these to be the bigger daddy of Youngstown’s general utility glove, but I would not necessarily consider them to be better. They certainly look cooler, with the TPR overlays on top of each finger. Also, a reflective coating increases visibility, which is especially helpful if working in low-light conditions and/or with members of a crew. They have foam inserts in the palm and fingers to help manage vibration and fatigue. 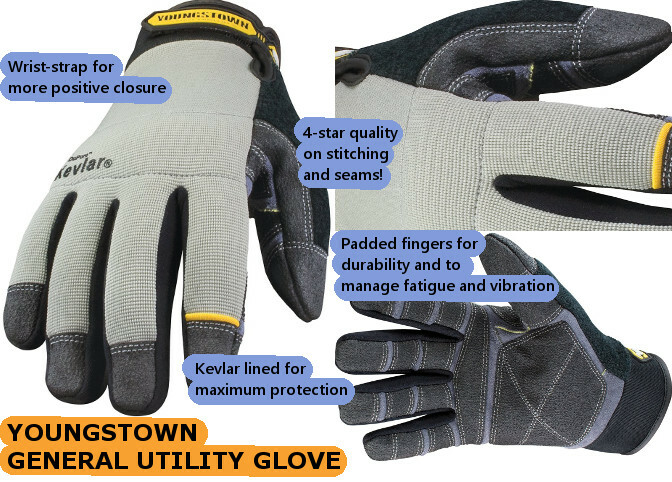 Youngstown says these gloves are certified to an ANSI cut level 5, and a puncture level 4 for protection. 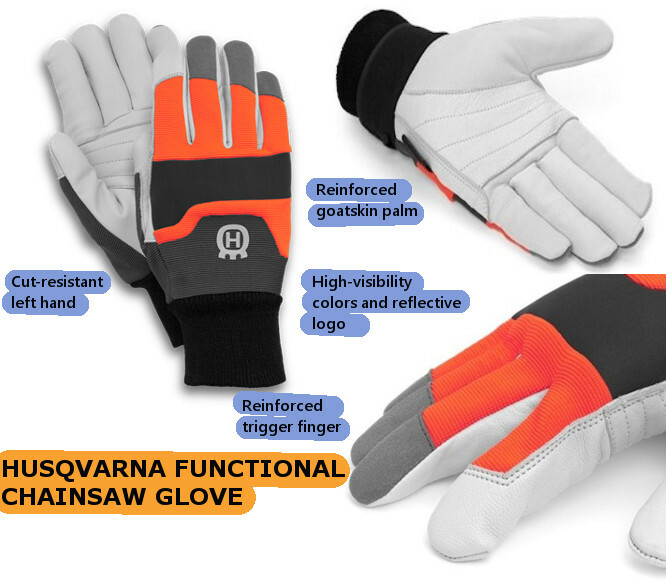 Husqvarna is tremendously popular in the chainsaw world, and fairly well-known for their protective equipment. Their functional saw protection gloves have a goatskin palm for extra grip and padding. The high-visibility colors and reflective logo can always be helpful. The back of the gloves are stretchy spandex, helping with comfort, and the left hand is cut-resistant. This is a great-looking, comfortable glove. They are rated Class 0, and 16 m/s per the EN 381-7 protection standard. I know this may be controversial, but I want to mention an alternative that’s rarely discussed for saw protection. Although in the photos, these types of gloves look like chainmail, they are actually an unusual fabric made out of glass fiber, spandex, and polyethylene. They are actually four times stronger than leather! And NoCry claims they were certified to the highest EN 388 level 5 cut resistance standard. They are machine washable. They have the consistency or feeling of a heavy-weight cotton, so they are very pliable and help with manual dexterity. A couple of obvious drawbacks here. They do not provide a very good grip. And also, the weave of the fabric is such that they probably don’t provide as much protection against splinters as something like leather. 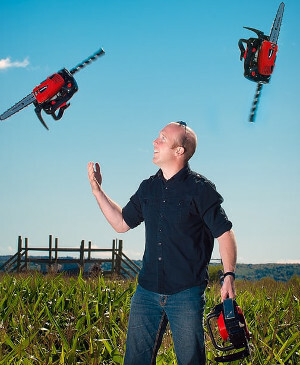 I tried these out with my chainsaw, and honestly I don’t think I can recommend them. 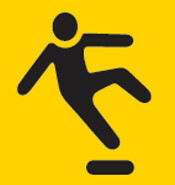 They are just too slippery. They are fairly inexpensive, so if you want to give them a try, I don’t think you will be out much money. 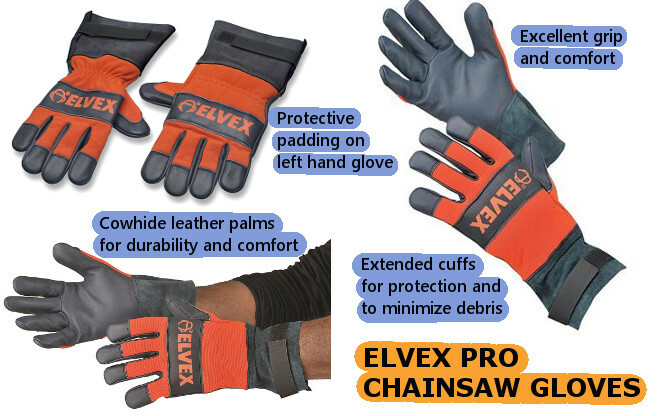 If you aren’t a lumberjack or don’t cut wood for a living, chances are you’ve never heard of Elvex gloves. I don’t know what this company’s marketing budget is, but it must be small! I came a cross Elvex as an option when one of my “pro” friends suggested them. And indeed, they do offer what they call a pro glove. They take a different approach to glove design than some of the other options I have covered. They are a looser, more over-sized fit that other chainsaw gloves, almost reminiscent of something you would see in a welding glove. This makes getting them on and off a bit easier. To my hand, they are supremely comfortable. They place protective padding primarily on the back of the left hand glove, and both gloves seem to have a good grip, whether wet or dry. The Elvex gloves have extended cuffs with strap closures, which I love. They claim EN381-7 certification, with class 1 cut protection. I tried to be fair with my ratings. The Husqvarna and the Titan XT gloves were really close, and it might boil down to which you prefer the styling of. 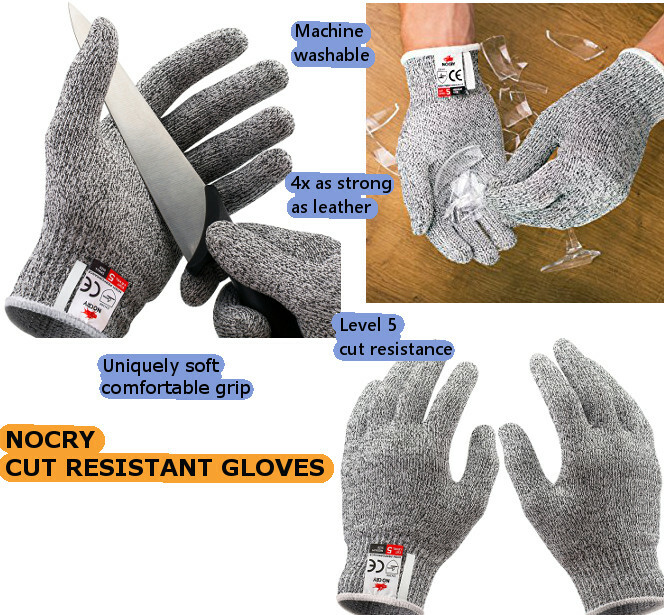 I want to spend a few minutes trying to summarize what I’ve learned about glove performance and ratings for cut resistance. Sounds like an awesome idea, right?? 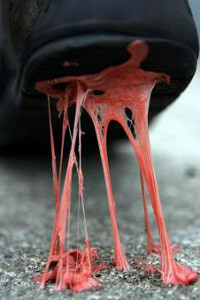 But as always, the devil is in the details. As awesome as the idea is, getting into the nuance of test methods and ratings may be more detail than you can suffer through. But let’s try! As you can imagine, there are many different certifications and governing bodies for safety equipment. Let’s take these one at a time, and explain what you can expect if you see them listed for a particular glove. 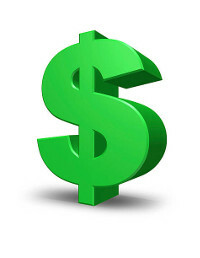 The ANSI/ISEA 105 standard was revised in 2016. In goes into detail about how a glove should be tested, and how it’s performance should be rated relative to cut resistance. 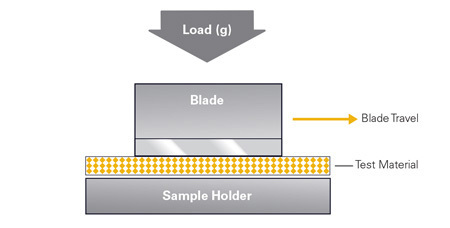 The standardized test uses a TDD machine to apply a variable load to a razor blade, which is dragged across the test sample. A sensor underneath the glove measures conductivity to determine when the razor cuts through the material. The data from a test sample is then used to look up the performance level in a chart. So if a glove was tested and was found to withstand 5000 g over one inch of blade travel, per the old ANSI standard it would be rated a 5. Per the new standard, it would be rated an A8. 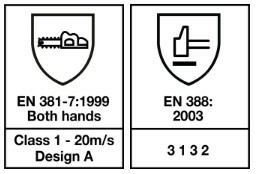 The EN 388 standard classifies glove performance according to four different factors. It’s easiest to show this as a chart. Specifically for the cut test, it uses a standardized test called a couptest rather than the TDD test ANSI uses. The couptest is very similar to the TDD test, but it uses a round/rolling blade and considers how many times it can move back and forth. EN 381-7, just by its name, seems to hold the most promise. It puts the glove in a certain class (Class 0 through 3) based on the speed of the chain it can withstand. Also, it has two different designs, A and B. Design A specifies a protection zone on only the back of the hand. Design B requires protection on the back of the hand as well as the top of the fingers. As if that’s not enough, one or both gloves can have either of these types of designs, and any of the Classes! Sometimes glove manufacturers will list several different standards for their product, taking more of a “shotgun” approach. This is more prevalent in Europe. Getting gloves tested and certified is expensive. At least in the US and Canada, the information can be hard to come by. Furthermore, manufacturers may use different standards, or even different revisions of the same standard, making side-by-side comparisons of gloves difficult.